What Happens If You Overstuff Your Stomach? Downing way too much food can make your tummy ache with the pressure. Rest assured that it's nearly impossible to make your stomach burst, even if It feels as if it might. Overeating stretches your stomach, but once the food passes through your digestive tract, your stomach shrinks back to its normal size. A one-time event may be highly uncomfortable, but it's unlikely to change your anatomy. Repeat your binge consistently for weeks, however, and you can permanently stretch out your stomach muscles. A normal human stomach can hold around 1 liter of liquids or about 2 cups of food -- even in the severely obese. When you eat more than this amount, your belly expands as if it were a balloon. With training -- repeated food binges -- your stomach expands more readily. 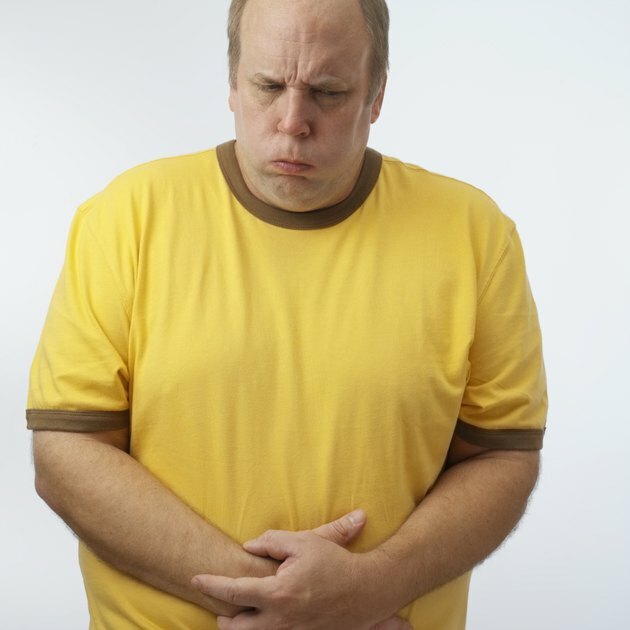 The first few times you eat too much and overstretch your stomach, you might feel unbearable discomfort. Over several months of overeating, though, your stomach muscles become used to stretching, and that overextended feeling becomes the norm. That means you need more food to make you feel comfortably full -- and even more to become stuffed. The type of food you stuff your stomach with can affect how you feel. Drink too much water -- especially carbonated water -- and you may feel an uncomfortable stretch without ever taking in a calorie. The water passes through rather quickly, however, and has little lingering effects of digestive distress. Eat a fatty meal, however, and you may suffer for hours as it takes time for your digestive enzymes to process fats. If you've filled up your stomach enough, you may feel it press up against the breathing muscle of the diaphragm, which further contributes to discomfort. Acid reflux, in which the acid in your stomach travels up your esophagus into your throat so you taste some sourness in your mouth, may also result. Breaking down a high-fat, or even protein-rich, indulgence can be downright painful for several hours. If you overconsumed a carbohydrate-heavy meal -- think Thanksgiving stuffing, cookies, cake and pie -- you may find you feel hungrier the next day. You didn't suddenly increase your stomach's capacity overnight, but you did mess with your hormones. All those carbohydrates raise your blood sugar quickly, subsequently causing a surge in the hormone insulin, which is sent in to deal with the excess sugar. As a result, your blood sugar drops quickly too, making you feel hungry again first thing in the morning despite your large meal. Even a taste of sugar or highly refined, processed snacks can make you crave more junk food later. If you overstuff your stomach with these foods, you didn't necessarily make it larger, but you did stimulate your taste buds so that you crave more. Sometimes a stuffed stomach isn't from the quantity you ate, but the way your digestive tract responds to that food. Gas and fluid retention can make you feel uncomfortably bloated. Swallowing too much air -- from drinking through a straw, chewing gum or drinking carbonation -- and eating foods that are fermented by gut bacteria, including beets, cabbage, figs and broccoli, may cause an overabundance of gas. A salty or fatty meal can make your body hold onto fluid so you feel puffy and uncomfortable. Regardless of the reason for your stomach's feelings of fullness, a light stroll can help get things moving. Avoid lying down, which can make your belly feel worse. Belching will help alleviate gas pains. Next time, to prevent that stuffed feeling, eat slowly and chew food thoroughly so that your body has time to kick in fullness signals before you've gone too far. CBS News: Does Holiday Gluttony Actually Stretch Your Stomach?